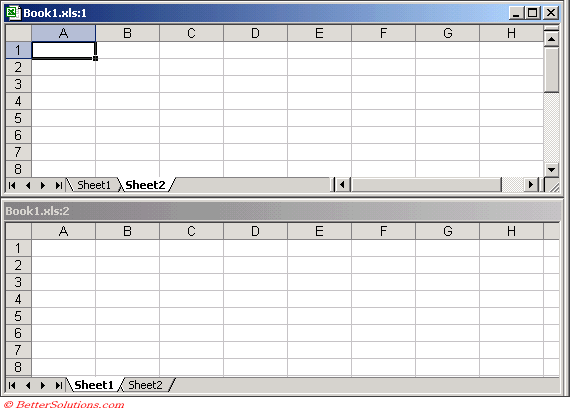 It is possible to display two different parts of the same worksheet at the same time. This can be done by opening a new window on the same workbook. This can be very useful if you are copying or moving data around on a worksheet or between worksheets in the same workbook. This is useful if you want to show two different worksheets from the same workbook at the same time. Enables you to see different views of the same workbook at the same time. You can arrange multiple worksheet windows in the same way you can arrange multiple workbooks. Tiled - This displays your windows one on top of the other or side by side. This is the default arrangement for multiple windows. Horizontal - This displays your windows horizontally across the application (top to bottom). Vertical - This displays your windows vertically across the application (side by side). Cascade - This displays your windows cascaded from the top left hand corner. Creates an additional window for the active workbook to allow you to view different parts of the same worksheet simultaneously. This is useful if you want to compare two worksheets in the same workbook. If you need to work with more than one workbook at a time then use the Arrange dialog box (>>) to display your workbooks with the same size on your screen. It is possible to open multiple view of the same workbook. It is possible to have open multiple windows of the same worksheet. This will allow you to view two different worksheets within the same workbook at the same time. This can be useful if you want to copy information from one part of a workbook to another part, especially if they are on different worksheets. 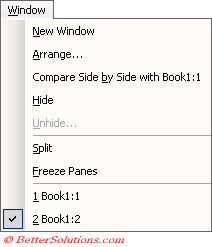 To create another window of the same workbook select (Window > New Window). One of the most common uses of this functionality is to view formulas and values side-by-side. Moving between multiple windows is identical to moving between two different workbooks. You use the (Window) drop down menu. In Excel you can't drag-and-drop across a split screen. (In Word you can). You can quickly close the selected window of a workbook using (Ctrl + F4). You can easily move a worksheet to another workbook by dragging the tab to the other workbooks window. You must have your workbooks arranged in separate windows. To copy a worksheet, hold down Ctrl while dragging.